When it comes to choosing a fence for your home, there are many options to choose from. Which is the most durable material for your climate? What colour and style will fit your yard best? Admittedly, there are many materials that would give you what you want but using vinyl or PVC fencing has many benefits compared to other fence building materials. The following are 5 reasons why you should consider a PVC fence for your home. It is cost effective – PVC fence is not just affordable to build and install, it is also quite cost effective to maintain. PVC fence does not need any elaborate painting or designs, you simply pick the colour of your choice and you are good to go. Additionally, PVC fences are cheaper than wood or iron, and they are also quite durable. The low installation and maintenance cost makes it a good idea for any home. It is very durable – Another good feature of a PVC fence is that unlike other materials, PVC fences tend to last for a longer time. This is because PVC and vinyl materials are not prone to rust, rot or blister. Also, they are strong enough to withstand virtually every kind of weather; moisture and sun do not damage PVC like it does wood and iron, so you will likely get a longer lifespan from your PVC fence than from a fence built with another material. Wide variety of styles – The beauty of PVC fencing makes it another good reason to opt for one. With PVC, you have a wide range of styles, designs and colours to choose from. Do you want a fence that blends perfectly with your landscape? Or you are interested in something that complements the colour of your home? Whatever your choice, you will definitely find it with PVC fencing. Eco-friendly – PVC materials are eco-friendly and recyclable. It is typically made from non chemical treated materials and so not harmful to the environment. Using PVC for your fence is possibly one way of doing your own to save the environment. And because it lasts a lot longer than other materials, you rarely see them in landfills and dump yards. Easy to maintain – With a PVC fence, you don’t have to concern yourself with sanding or painting. 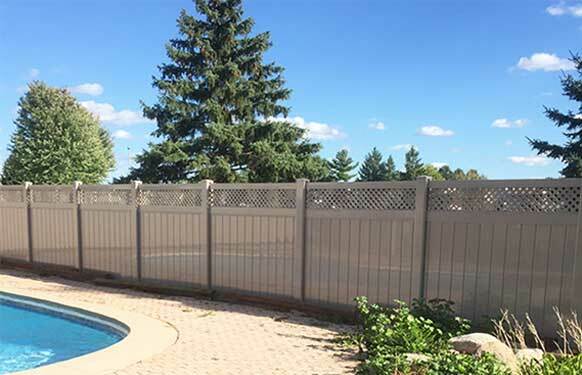 According to Horizon fence, one of the high Quality Ottawa Fencing Companies, this type of fence is one of the easiest to maintain. The fact that it made from plastic means that it is unlikely to have any permanent stain. Cleaning a PVC fence is just a matter of wiping down with a damp cloth or washing with water and soap, you don’t even need a professional to do this. Spaces are limited! Get your quote today! Contact us with any questions or concerns—We’re only a call or click away. We look forward to hearing from you!